The situation in Houston and surrounding areas of southeast Texas hit hard by Hurricane Harvey this weekend has gone from bad to worse as floodwaters continue to rise, with some of those left behind beginning to panic. According to CNN, the pace of emergency calls has only sped up as the water continues to deluge parts of the city. Some two feet or more of rain has already fallen, a total likely to double by the end of the week, the earliest the rain is likely to let up. A few locales may receive up to 40 to 50 inches more water. The US Coast Guard is fielding roughly 1,000 calls per hour and rescued 3,000 people using aircraft and boats on Monday alone, while the Houston Fire Department rescued 400 people and police rescued an additional 1,000 the same day. 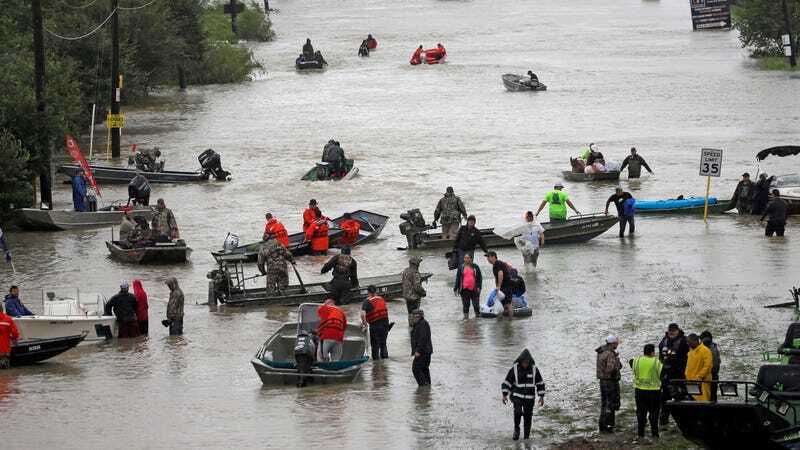 Texas National Guard units continued to run rescue operations even as night fell on Monday, NBC5's Meredith Land tweeted. CNN added Louisiana-based rescue force Cajun Navy is reporting that panicked citizens have begun swarming their vessels and, according to volunteer Clyde Cain, have even shot at them. In one case, after a boat broke down and its crew took shelter in a truck, Cain said locals attempted to steal the boat to get to safety. Per the L.A. Times, the number of confirmed deaths has risen to at least nine people. That number is almost certain to rise, as the flooding is still in full force and many people may have been trapped in homes or vehicles. 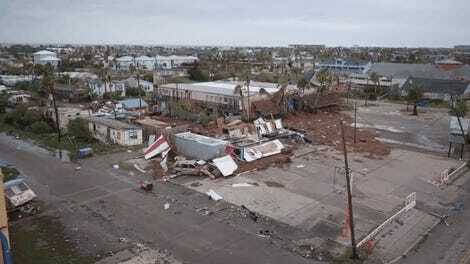 While Houston, the nation’s fourth-largest city, had the highest concentration of people immediately impacted, devastation in coastal cities like Fulton was just as widespread. Photos posted by the Corpus Christi Caller Times’ Julie Garcia showed deluged neighborhoods, overthrown trailers and houses which had been torn apart by the storm and floodwaters. Federal Emergency Management Agency officials say at least 450,000 people are likely to seek some form of federal assistance, per the New York Times, while roughly 30,000 people will require emergency shelter. Locals also pitched in to save pets and other animals stranded by the storm, with area shelters planning to send rescues to facilities in other cities and states with excess capacity. As Gizmodo previously reported, Harvey was particularly dangerous because it stalled over the region instead of moving inland, where it would have lost energy and begun to dissipate. 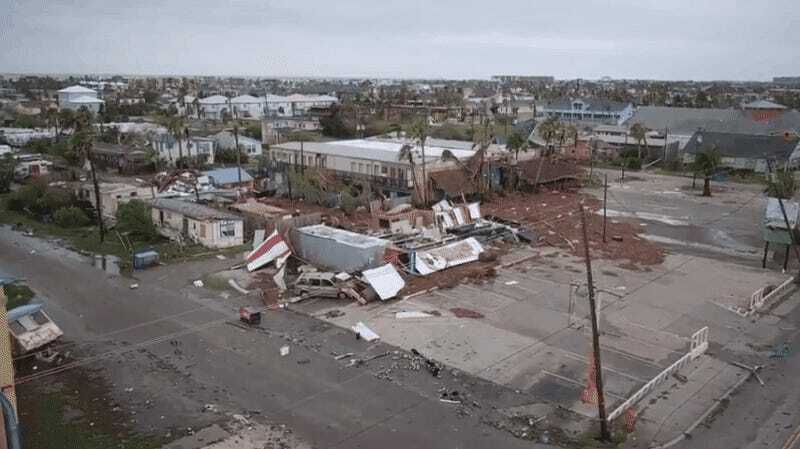 Colorado State University atmospheric scientist Phil Klotzbach explained the storm was trapped between two high-pressure areas in the western and southeastern US, right next to the Gulf of Mexico, allowing it to pull energy and moisture from an exceptionally warm pocket of water.